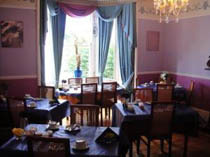 The Thistle Guest House offers cosy bed and breakfast and can be found at East Hermitage Place in Edinburgh. This is a fully non-smoking guest house with modern interior decorations with rooms at reasonable prices. The Guest House boasts free parking and is just a ten minute drive from Edinburgh's astonishing city centre. This is a great place to stay if you want to avoid the immediate hustle and bustle. Edinburgh Castle is just ten-minutes away, and is an absolute must for sightseers. You are also two miles from the Royal Mile which has plenty of souvenir shops , cafes and eateries. The Guest House is overlooks what was at one time a golf course but is now a park area. The B&B is also within walking distance of the Royal Museum of Scotland and The Palace of Holyrood House. The B&B houses seven newly refurbished bedrooms including single, double, twin and family sized rooms. On the whole the Thistle Guest House is an old Victorian house, but with modern furniture. It is situated in a very beautiful city, not far from many famous tourist attractions. It is suitable for all the family. Guests with kids in toe will be pleased to learn that this is family friendly B&B. Children aged three and under can stay for free when using either bedding there and/or cots. The helpful and friendly staff will try to provide all guests’ needs. The Long-stay, long-term guests are given a discount. Breakfast icludes a continental breakfast, in the dining room overlooking Leith Links (a park). Tea and coffee are available in each room.